While the team was going through the trials and tribulations of player selection and gelling as a team, Manager Sandy Watson had the additional problem of funding to cope with. January 7th 1947. 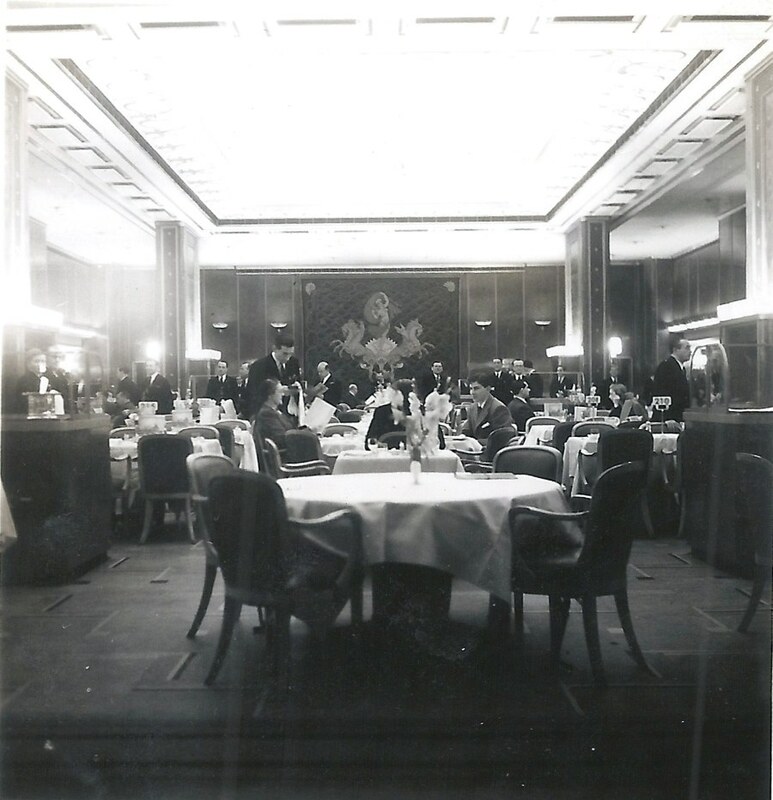 Before departure for New York, the team was feted at a luncheon in the Beaver Barracks, where we had lived while trying out at the Ottawa Auditorium next door. The Deputy Air Member for Personnel was host, and Air Marshall Wilf A. Curtis, chief of the Air Staff, wished us Godspeed. "With a will to win", the Air Chief said, "The Flyers could not lose"! A presentation of slverware was made to George Boucher who selected and coached the team in Canada. 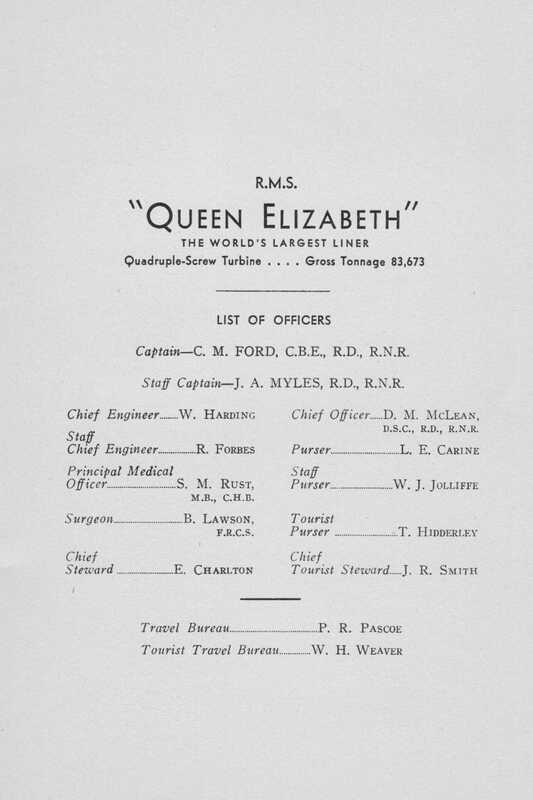 Music was played by the RCAF Band, directed by FO E.A. Kirkwood. 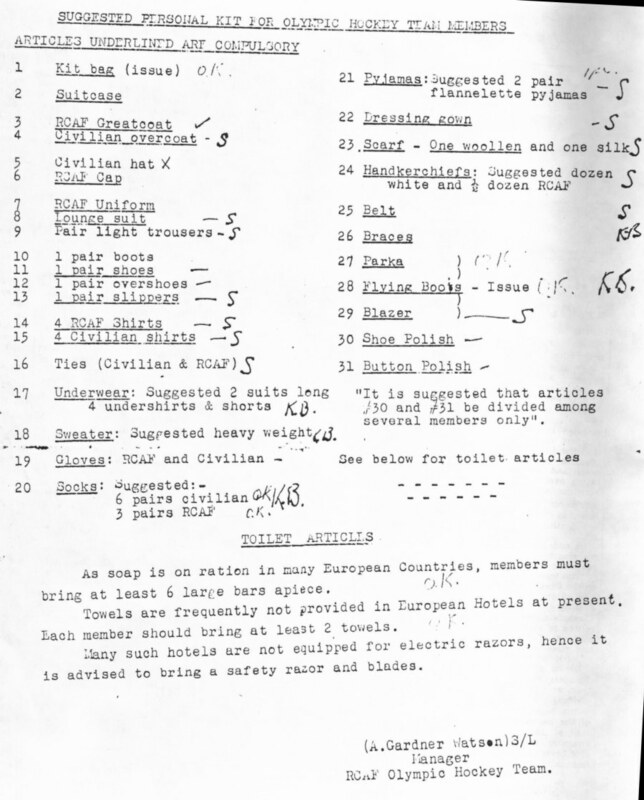 With Europe still suffering from the deprivations of the Second World War, we were advised to pack our own bars of soap and what not, as these basic items were still being rationed overseas. 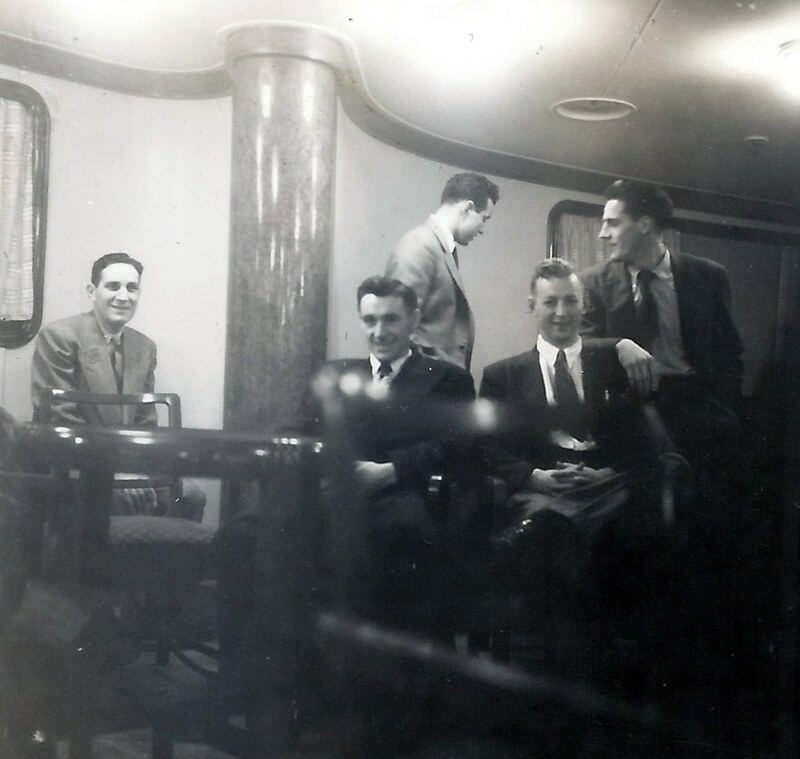 We would sail from New York loaded with gifts for wartime friends in England - as a good number of our players had served overseas during the war. January 8th 1947. 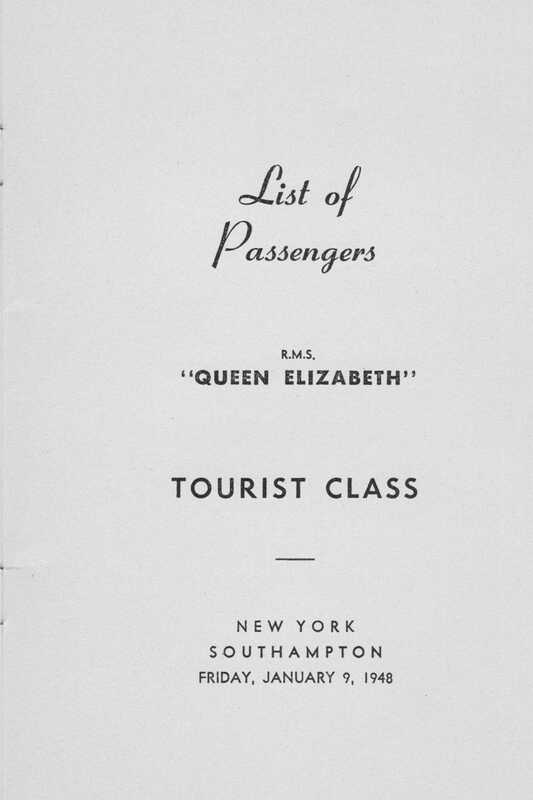 Thursday was travel day to New York to catch the Queen Elizabeth ocean liner to Southampton, England. 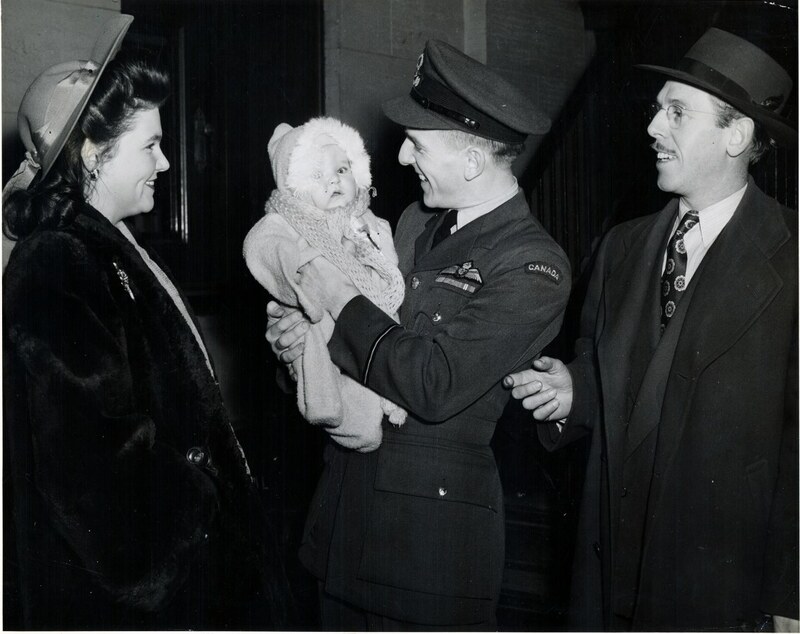 With our equipment already on route, we were given a "rousing” send–off from Ottawa’s Union Station with several players’ relatives and friends present as well as a contingent of military well wishers – some there at the "encouragement" of Air Chief Wilf Curtis. Apparently a local newspaper had cynically commented that we were quietly "slinking" out of town. Wilf would have none of this. 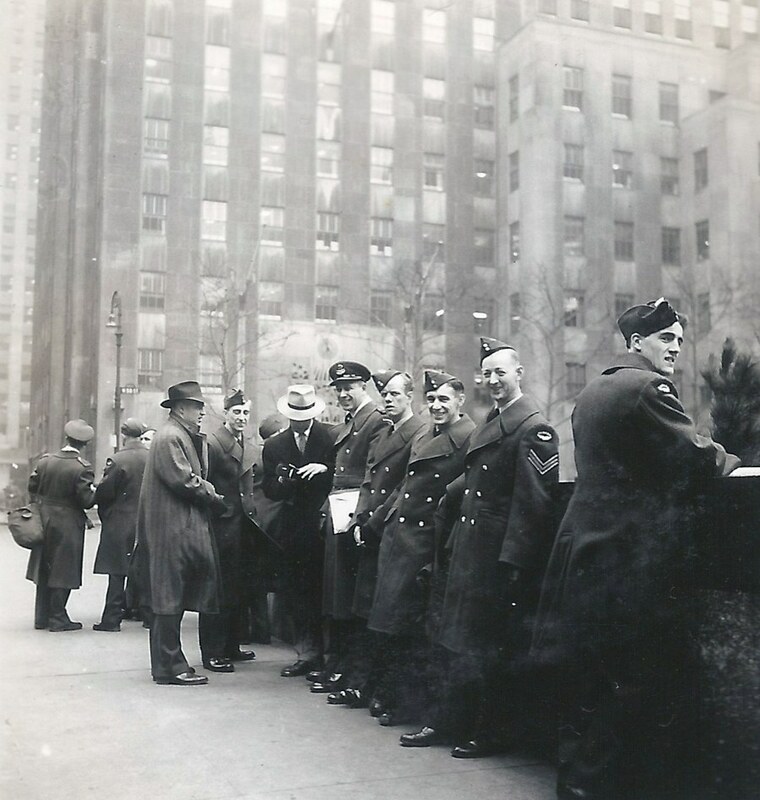 He made sure that enough air men and brass were down at the station to ensure we were given a "rousing” send–off". The RCAF Central Band was there in full splendour and volume playing the Air Force March Pass. It was this over–the-top in–your–face sort of reaction to the press that the players loved and put a smile on all of our faces. We could not have asked for a better send–off. 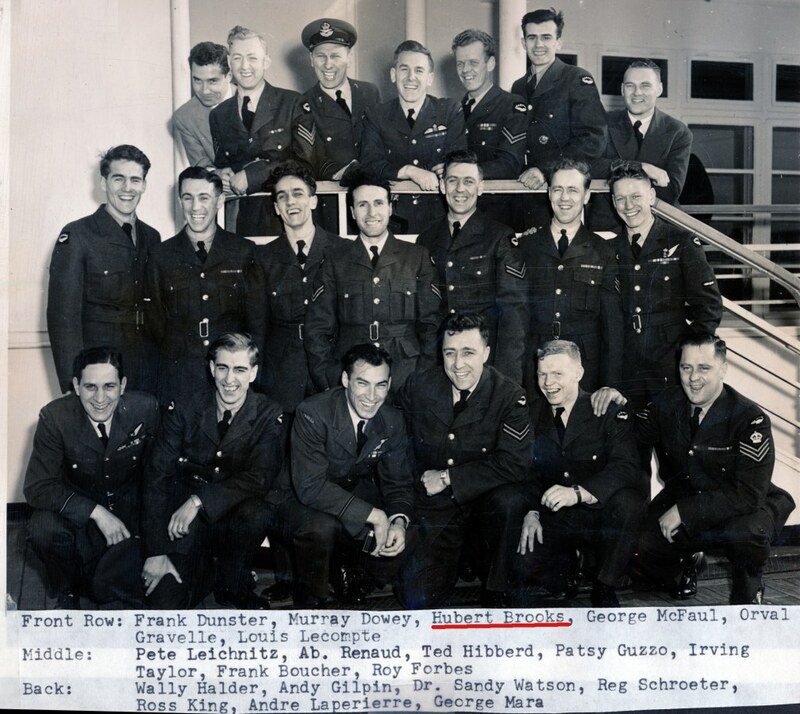 Everyone on the team except civilians George Mara and Wally Halder were in RCAF uniform. 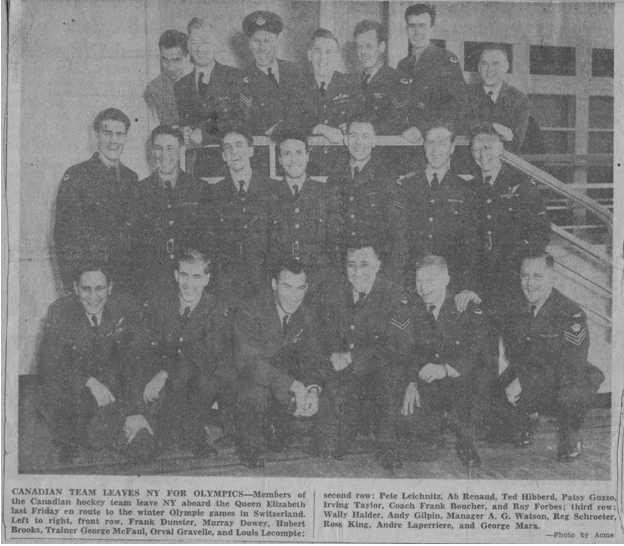 Sidney Dawes, President of the Canadian Olympic Committee, Air Vice Marshall Morfee, Air Commodore Dave McKell, Flight Lieutenant Joe McKinnon, were all present to send us off. 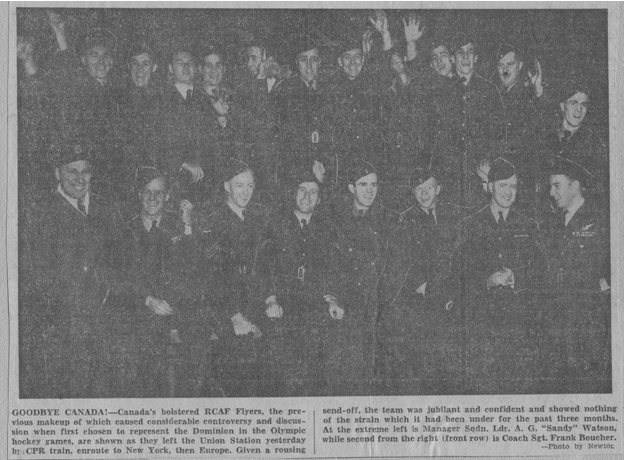 "The RCAF was solidly behind the team from the start to the finish." Canadian Olympic speed–skaters Mac McKay and Ab Hardy, who were making the trip overseas with us, were also present. "After all of the hard luck we’ve had so far, we’re bound to get a few breaks once we get into Olympic competition. Judging by the way the team has improved lately and the confidence of the players as a whole we may surprise a lot of people in Canada." 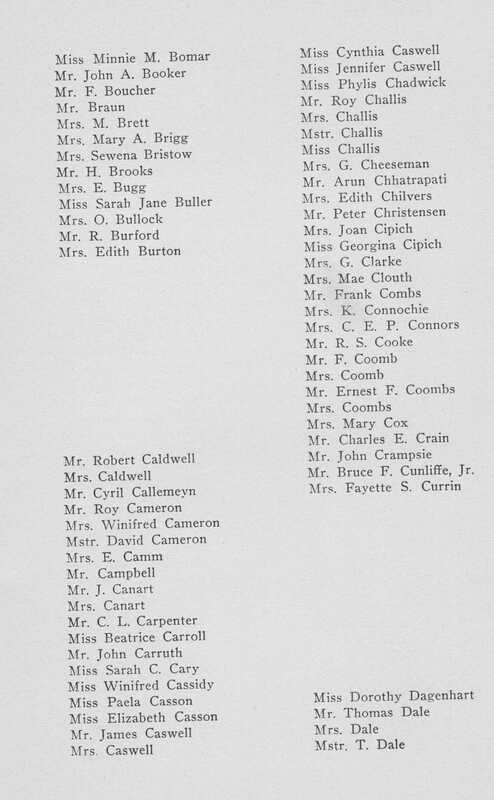 Hubert Brooks is at the extreme right in the front row in the above news photograph. When the team was assembled on the platform, Air Vice Marshall A.L. Morfee and Air Commodore D.E. MacKell went down the line wishing each player good luck. 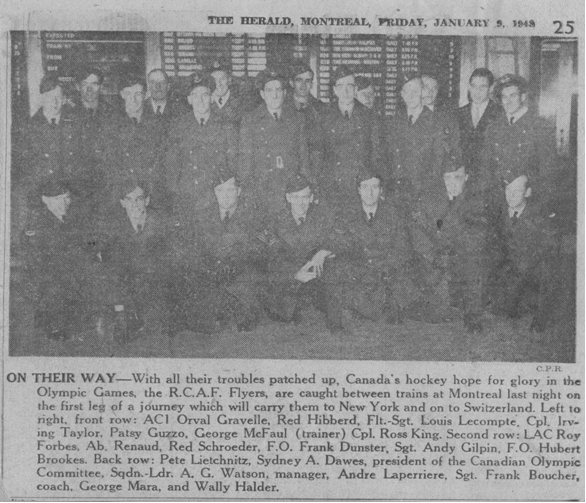 With the strains of "The Air Force March Past" and the cheers of hundreds of well wishers ringing in their ears, at 4:20PM the RCAF Flyers hockey team pulled out of Union Station by special CPR coach on the first leg of their journey to the Olympic hockey wars. the Ottawa Citzen writing the day of the Flyer's departure: "THE FLYERS, LIKE THE ARABS, ARE FOLDING THEIR TENTS AND SILENTLY STEALING AWAY." "Perhaps the happiest player was F/O Hubert Brooks of Montreal. 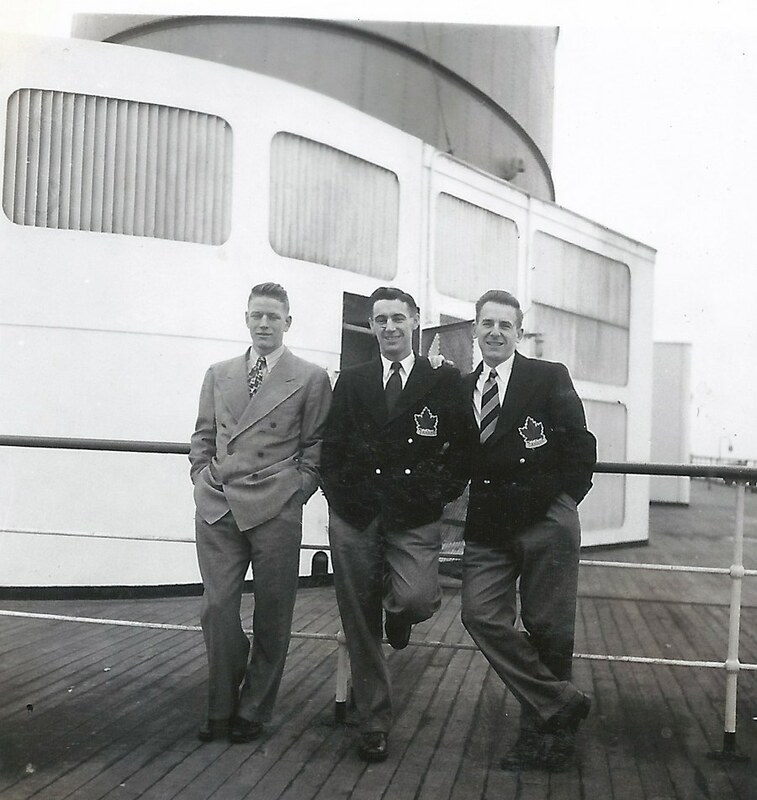 "Brooksie," as his teammates called him, was on his third mission from Canada to Europe. 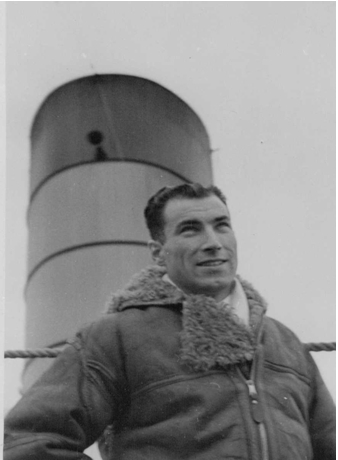 As a navigator with 419 (Moose) Sqn. 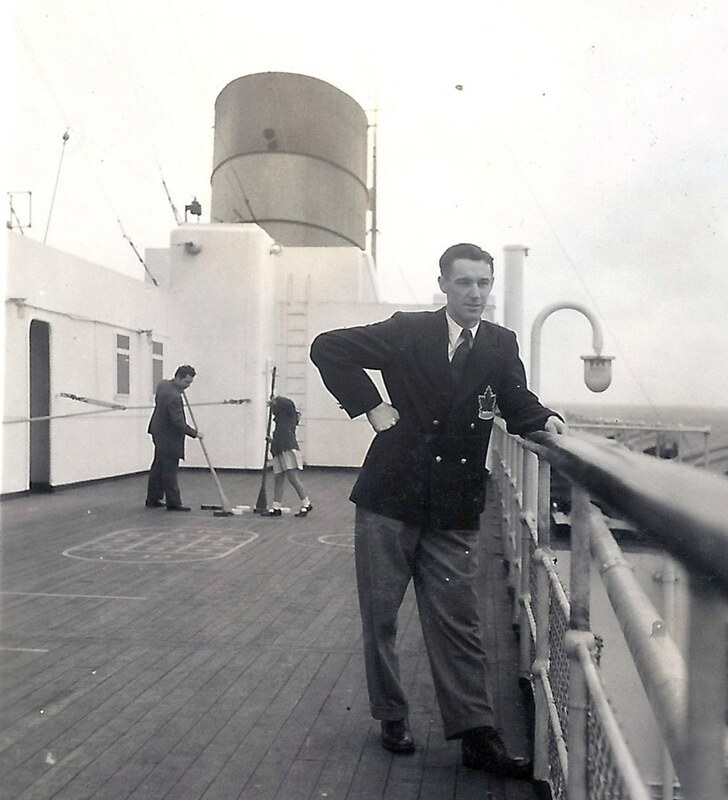 Brooks was shot down over Hamburg in 1942 and spent the rest of the war escaping and evading. For his outstanding efforts he was awarded the Military Cross, just one of five RCAF airmen to receive the decoration. 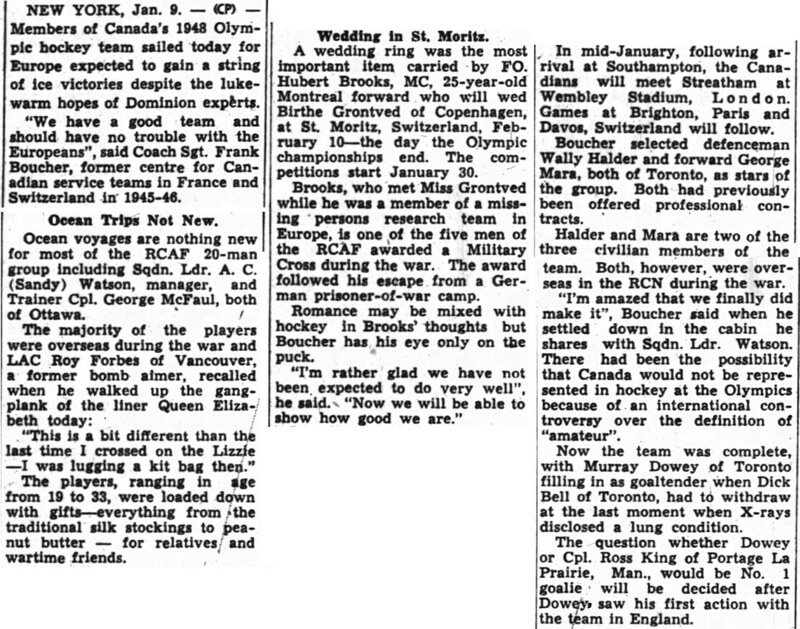 Now in 1948, Brooks was going back to Europe, for the third time, not only to help Canada battle for world hockey supremacy, but to marry his fiancé Birthe Grontvend, who he had met in Europe just after the war when he served with the British Missing Research Unit, locating missing personnel." More on this later, but when I found that I had made the team, I contacted Bea (fiancée Birthe Grontved) to arrange for her to meet me in St. Moritz, Switzerland. When I was in Europe right after the war with the Missing Research Unit I had met and fallen in love with Bea. Once back in Canada I could not get her out of my mind and made a long distance proposal which she accepted. I had been trying to arrange her entry into Canada when the exciting V Olympics opportunity occurred giving me the opportunity to return to Europe. Arrangements were starting to fall into place! We arrived in Montreal a few hours later to be greeted by a number of newspaper photographers. Hubert Brooks is at the extreme right in the second row in the above news photograph at the Montreal train station. 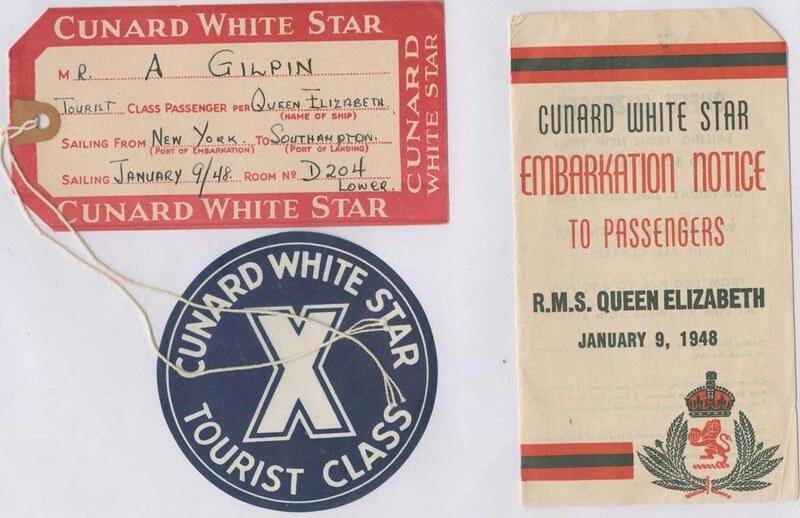 We left Montreal about 10PM and arrived in New York about 8AM the following morning January 9 th. Friday, January 9th, 1947. 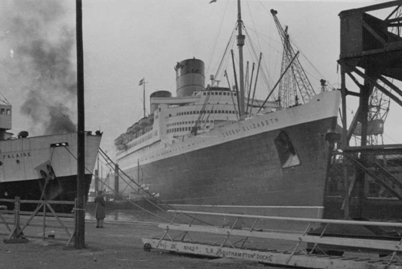 The team boarded the Queen Elizabeth late in the afternoon in preparation for a suppertime departure for the long transatlantic trip to Europe (Southampton, England) – heading across the Atlantic on a ship not knowing what to expect. With the last minute addition of goalie Dowey, for that matter with the next to last minute addition of a number of players, we were to hit Europe without having played a single game together as a team! With the exception of the original 8, we had little in common and knew even less of each other as we were thrown together mere weeks before our departure for Europe. 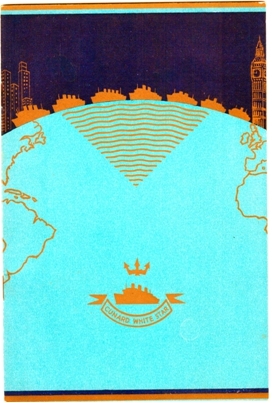 The 6 day voyage across the Atlantic was an opportunity to get to know each other. Shortly after boarding we all assembled on deck for photos to be taken for various newspapers across the USA and Canada. Paramount News was also there filming. 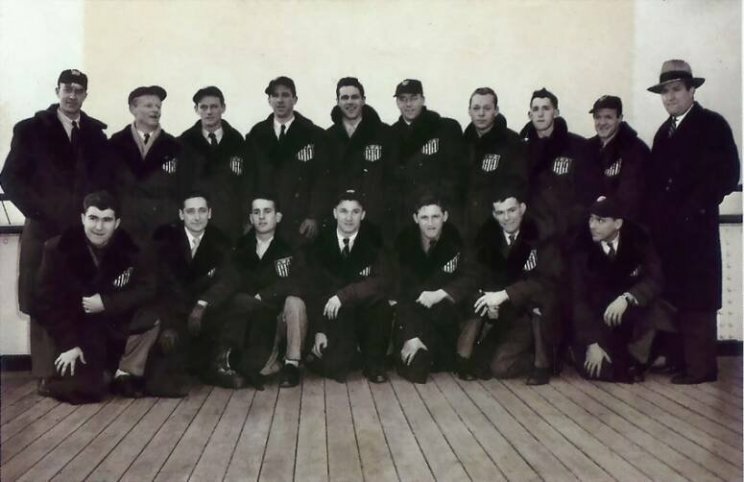 The US Olympic hockey team arrived on deck a short time later and group pictures of the two teams together were taken. Hubert Brooks is seen kneeling third from left in the front row in the above news photograph aborad the Queen Elizabeth in New York Harbor Prior to departing for Europe. Hubert Brooks is seen kneeling third from left in the front row in the above news photograph. 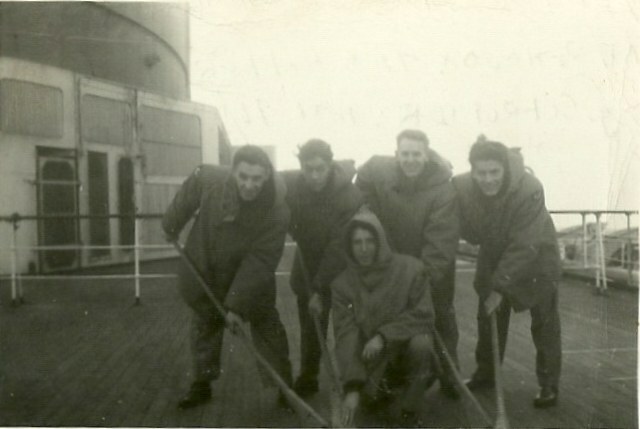 As it turned out the American (AHA) hockey team sailed with us as well. However the Americans travelled first class whereas we were in tourist. 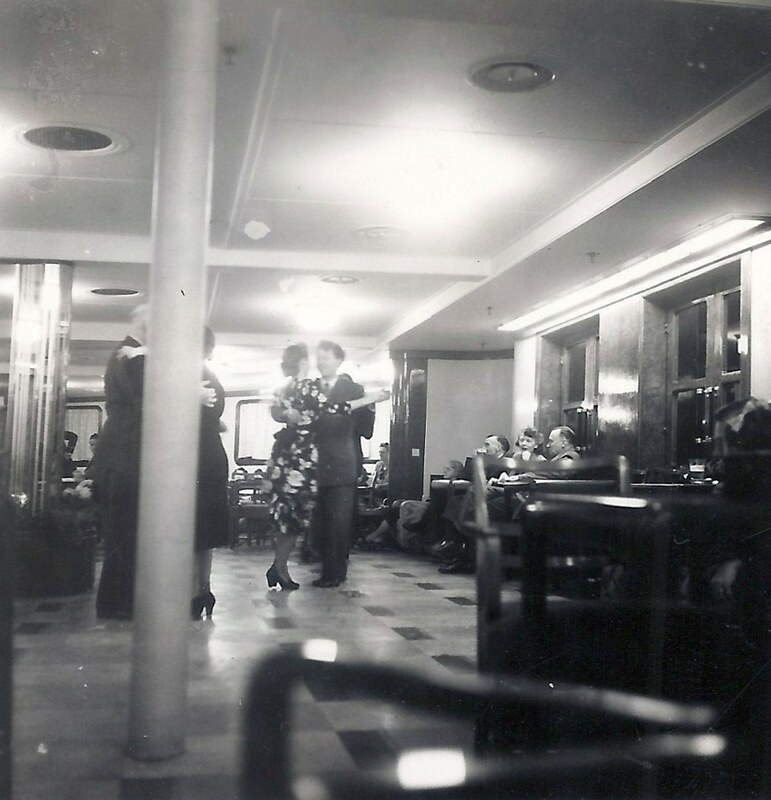 The Americans walked the decks in their blazers and grey flannels whereas we were Air Force blues. We took a lot of flak from the Americans as to how we didn’t stand a chance against them in the Olympic hockey competition. With time on their hands and nothing else to do some members of the USA AHA Olympic hockey team offered to bet us that their team would whitewash us by at least 10 goals. No bets were taken by the Flyers still smarting from recent defeats by Canadian teams. but I thought it was ridiculous baiting and the Americans would later come to eat their words. 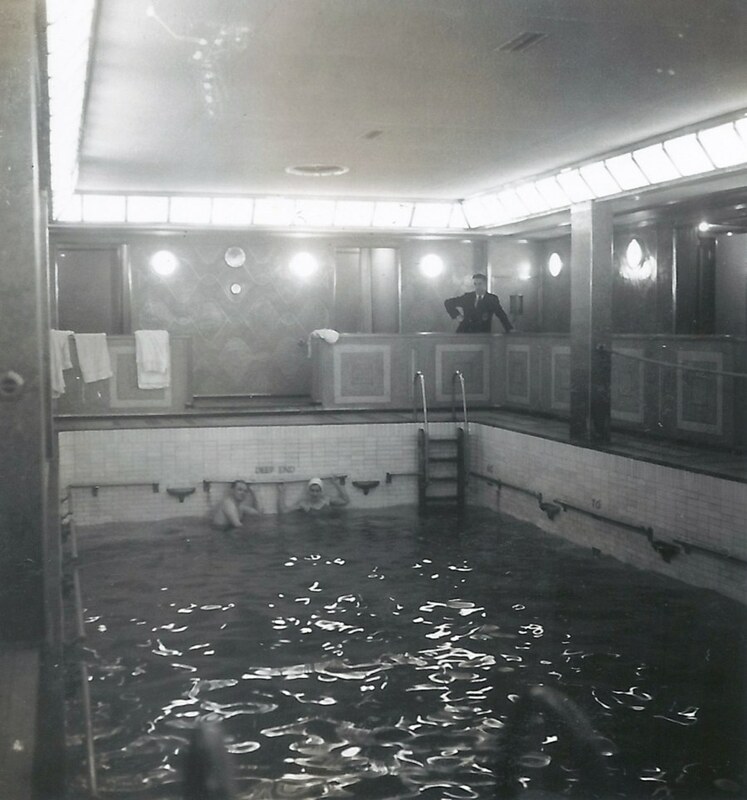 Also on the trip with us headed for the Olympics was Johnny Weissmuller, a former Olympic swimmer that most of us best new for his role in the Tarzan movies. Henry Ford and his new wife were on board, as was Hollywood actress Paulette Goddard and her husband Burgess Meredith. As you might guess, they were all in first class. Several players got autographs and talked to the celebrities. Sandy further cautioned not to become "swell-headed" if and when members of the press fussed over you. It was NOT because of your individual talents but rather because you were a member of a Canadian Olympic Team. 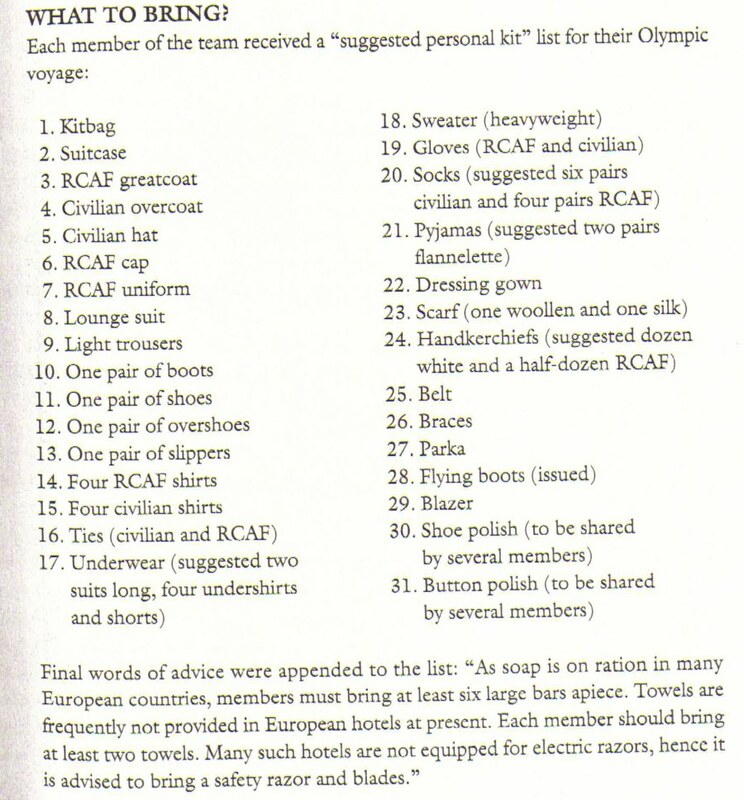 The operative position was that we were all proud to be a member of the "team". 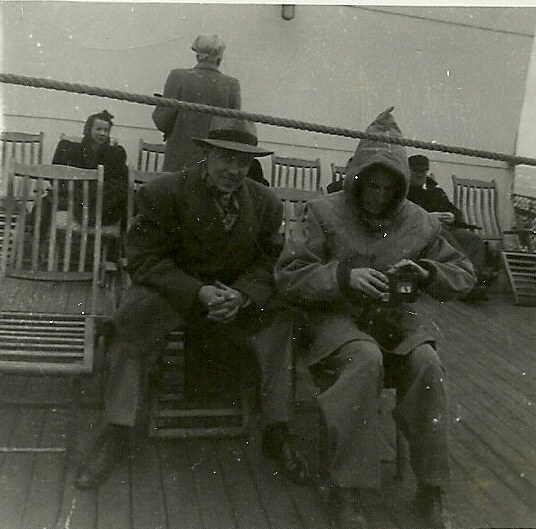 We arrived in Southampton, England Thursday Jan 15th, 1948 at 1AM in the morning but did not leave the ship until 10AM.